Ali Akbar Javanfekr, quickly climbed up the promotion ladders after the 1979 Islamic revolution. 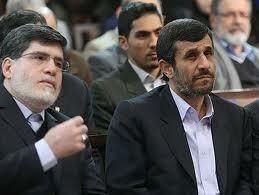 Soon after the revolution he was sent to Madrid to head the Islamic Republic News Agency, IRNA in Spain. He was deported from Spain after he openly called for the murder of Salman Rushdie during a radio program. The expulsion served Javanfekr well however and he was promoted to the head of IRNA in Khamenei's office when he was the president of the Islamic Republic and later the head of IRNA in the Supreme Leader's office, when Khamenei became the Supreme Leader. It was said that no news or telext leaves the Supreme Leader's office without Javanfekr's approval. Javanfekr managed to get back to Spain in year 2000 during Khatami's presidency until he left IRNA and joined Ahmadinejad's office when he was the mayor of Tehran. He has remained loyal to Ahmadinejad ever since and is now the press advisor to Ahmadinejad as well as the head of the government organ, Iran Press Institution. Hence as an important effective Ahmadinejad ally, he has become one of the targets by the 'principalists' in the factional infighting. Last Sunday, the courts sentenced him to six months prison for publishing 'vulgar' pictures in an article 'incompatible with Islamic values and standards', as well as a three year ban on any journalistic work. The controversial article for which he was sentenced was an article in Khatoon, one of the magazines under his responsibility, which simply discussed and questioned why the chador, favoured by the religious hardliners as the 'superior dress code for women', should be regarded as the 'superior veil'? One day after Javanfekr's sentence was passed, he was holding a press conference at the Iran Press Institution, when judiciary and intelligence agents came to arrest him. The attempts to arrest him however were met with stiff resistance by the employees, many of whom have ties and connections with the intelligence ministry and even took part in suppressing the post-election protests. Even tear gas was said to have been used inside the building. Footages of the event released on youtube, show employees burning paper to counter the effects of tear gas. While the massive melee was going on, Javanfekr was frantically making phone calls to stop the judiciary agents from arresting him. Ahmadinejad's threats to take counter measures and 'spill the beans' finally convinced the judiciary to issue the order for retreat and although more than 30 newspaper employees were injured and arrested, Javanfekr was spared. Javanfekr then made statements which said 'stating a different opinion is not a crime and the country should not be dragged into a situation where there is no freedom to criticise'. Rich words from someone who himself has had a hand in cracking down dissent. Of course the freedom, Javanfekr is talking about is for his own faction's freedom only and not for anyone else. There are important conclusions from this incident.